The running aground and the shipwreck of the britsh cargo ship "London Valour"
** The number indicated refers to that at the time of the shipwreck. It is includes the two wives on board of the Captain and Radio Officer, who were guestes on board but weren't considered part of the crew. At the extreme east of the breakwater seaward at the port of Genoa . On the 1.4.1970 the vessel sailed from Novorossisk with 23.606 tons of crome on board. 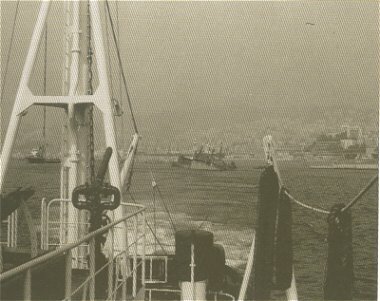 On 7.4.1970 the vessel arrived at Genoa and anchored in the road awaiting orders to come into port to unload. 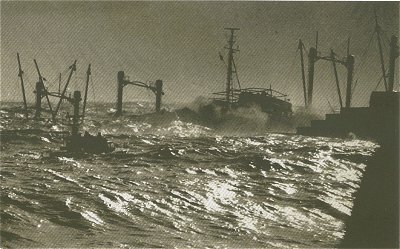 At 12.00 hours on 9.4.1970 the pressure on the barometer was very at 748 mm. The sea was swelling up and was washing over the breakwater, there was a near absence of wind (SE at 2/3) There was no warning of tempest arriving, according to witness on board, neither transmitted by radio or by the port. At 13.00 hours the wind changed course SW increasing force and intensity. There was a meeting on the command bridge, but the Captain D.M. Muir, didn't give any particular intructions, not thinking that the situation could be of any danger, and went back to the cabin to join his wife. 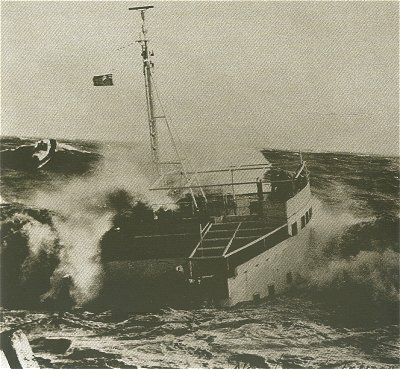 The "London Valour" being battered by gigantic waves. Note the force of the wind, which was ascertained to be about 100 kms/hour (55 knots). Five persons are on the bridge top; Captain Telmon, on board a launch, is attempting to rescue them. At 13.30 the Officer on duty on the bridge advised the Captain and the engine room guard Officer that the weather was rapidily deteriorating. It was noticed by the First Deck Officer, who looking out of his porthole saw that the breakwater was getting too close and realized the imminent danger sent out a General Alarm. On hearing the alarm the Chief Engineer became aware of the urgency and tried to accelerate as quickly as possibile by start-up the turbines. Unfurtunately the order given preceded the vessel impact against the breakwater. At 13.50 the south west wind reached force 8 and the barometer was registering the very low pressure of 742 mm. At 14.22 the “ London Valour” following a rapid movement leeway was pushed by the waves against the rocks surroundings the breakwater. In the disaster 20 persons lost their lives. 38 members of the crew: the more courageous jumped into the waves flung into the rescues arms in pilot boats in the open sea, recuperating them with that spirit the English call “heroic”. The most dramatic phases of the tragedy, was of the one part of the crew who were concentrated on the central bridge of the vessel. This was the most dangerous place to be because the ship was being battered by the waves, washing overboard and smashing her against the breakwater. A cable attached to a racket was shot from the vessel onto the breakwater allowing the firemen to erect a ‘to and fro' system (rather like a funicular cable system) which actually saved 3 Indian sailors. The system was tested and seemed to be safe, so the Captain convinced his wife to try and save herself by going down the cable as well. However the system blocked. Mrs. Muir didn't have the strength to hold onto the hook on the line and fell onto the rocks under the horrified eyes of the crew and her husband who, indifferent to the danger, wanted to give her his last “addio” waving the Union Jack. A little later, a gigantic wave washed away the Radio Officer and his wife, disappearing together, drowning in the tourmentous sea. The 3rd Engineer was washed away by the same wave and was brought out to sea, and miraculously saved by a lifebelt thrown down from Captain Enrico's helicopter. At the moment, the Captain was seen for the last time, with one leg seriously injured. The same incredibile wave lifted the Chief Officer, to a height of about two floors, allowing him to reach the Monkey Island (the bridge above the wheel-house), where there was already the Cadet and other Indian se amen. These seamen, although they were ordered by their superiors to jump into the sea in the hopes of saving themselves, refused, thereby dying massacred by the fury of the sea between the rock. The English Officer were however saved by the pilots and by the Genoa Harbour Masters' boat.  due to the courage and initiative demonstrated by the English Second Officer.  The stern was free of the breakwater. From that extreme position, the more corageous jumped into the sea and were rescued straight away by the rescues team standing by. Other significant salvage operations were helped by the cable installed by the fire brigades, as mentioned previously and the vessels' personnel. The London Court of Law on 17.5.1972 passed the following sentence “The seawreck and the consequent loss of the “ London Valour” was caused by the erroneous conduct of Captain Muir..” It emerged also that Captain Muir forgot to inform his Deck Officers, that the Engineer section needed a previous readiness warning before giving a “Go ahead order”, due to maintenance works having been carried out on the auxiliary engines duly completed that same morning. When the divers went underwater to inspect the hull after the accident, they noticed that 7 chain were still stretched and intact. The anchor rested on the muddy depths at about 25 metres, but the end joints of the arms were turned upwards and the steel chain passed between them. This was the fatal explanation of the speed of the vessel at the time it neared the breakwater, from the moment she bore the strength of the sea and wind. The anchors' arm overturned due to the impact with the chain and couldn't reach the depths, enabling it to hold onto it's position thereby resisting the effect of the tempest. The above has been taken from the Report Of the Official Inquiry into the Loss of Stranding S.S. “ London Valour”. About 14.35 hours on the 9th April, I was in the operations room of the Pilot Station with Pilot Aldo Baffo. Without warning we noticed that the English vessel “ London Valour” was very near the seaward side of the breakwater (about 200-300). We realized that the situation was dangerous with very high winds and an unexpected swell in the wawes. We immediately called the CAP Maritime Office comunicating that in my opinion the vessel was in great difficulty, to raise the alarm and that I would be going out immediately with the pilot boat. I raised the alarm at the Tugboats Station who immediately gave orders to tugboat FORTE and others to go out. 14.40 hours – Pilots Giovanni Santagata and Aldo Baffo went abord the pilot boat TETI under command of helmsman Barone and engineer Fanciulli directed towards the port entrance. 14.45 – The pilot boat enters into the open sea trying to make conctat by VHF with the “ London Valour” without any reply. The gathering force of the wind and sea had by then become a south west tempest. We saw the vessel still about a hundred metres from the rocks of the breakwater. The crew had already put lifebelts on. We saw the ship hit the rocks at about 14.55 hours. 15.00 hours – Captain Lay (Technical Official) of the Harbour Masters' Office, asked me to pass my VHF onto channel 16.He communicated to me to assume responsabilità in directing the coordination of the rescue operations. It was ordered to keep constant contact with him; which was followed to the rule throughout the whole operation whilst aboard the pilot boat TETI. With the TETI we made our way slowly, due to the violent force of the wind and sea and got to a position south of “ London Valour” between the stern and command bridge. We saw the crew had divided into two groups, one at the stern and the other on the central bridge who were making disperate signals with their hands. We managed to get to a minimum distance of about 50 metres from the vessel. Via the VHF radio we were informed of the operations organised on shore for their rescue. We saw the C.P. 233 go out. 15.45 – Pilot Baffo had to leave the pilot boat to go aboard the m/v “Canguo Verde” to pilot her usual berth. I continued to direct operations from the open sea. The situation on the “ London Valour” was worsening. The vessel was sinking lashed by high waves. The double bottom where the fuel was stored had been smashed into. To the stern of the vessel an automaticly inflatable dinghy was put into the sea onto which only 3 sailors clambered onto it (unfortunately). The dinghy equipped with a covering sheet fotunately managed to go towards the rocks at the International Exibition at the Foce. With the TETI I went leeway and being very light I slipped the hook easily. At a slow speed so as to not lose the hook, I brought it very close to the breakwater seaway side. I took aboard the 3 sailors then transferred them onto another CAP boat. One of them (I think he was a young official) asked if he could stay with me to help with the operations. As he seemed to be in good condition, I consented to it. 16.15 – We went outside the port again and almost straight away saw another victim literally completely covered in fuel oil and near collapsing. The English official (Mr. Caffrey) believing he was a friend, generously dived into the sea to rescue him. We threw a life buoy to which both of them held onto. Their recuperation in open sea was impossibile due to the sudden and violent movements of the pilot boat. We than towed them to a calmer zone inside the breakwater. The engineer tried to hoist them aboard but due their being completely covered in fuel oil, kept on slipping away. The tugboat INDIA under the Command of Captain Ragone came to help us who passed a rope around them allowing us to tow them ashore. Another image of the shwipwreck of "London Valour" towed by M/t "Torregrande"
16.40 – We went out into the open sea again. We saw another victim in good condition and strength. We went leeway under the shelter of the breakwater. We threw him a lifebelt and towed him to the shelter of the breakwater and was recupered and taken shore by Captain Fanciulli with the tug ALGHERO. We went out again into the open sea to search for other victims. We came across two bodies. We towed them one by one to the shelter of the breakwater. I don't know who recupered the bodies and took them astore. At 17.45 the pilot boat PREVE came towards me, and Captain Tanlongo indicated to me to go back to the shelter of the breakwater. We came side by side, and excahanged crews includine myself. The Pilots Ragazzi and Fioretti boarded the TETI with helmsman Grillo and engineer Mortola, who turned round and went back to the open sea to search for more survivors. Right through the whole operation Captain Lay and Chief Pilot Giovanni Raimondi were kept informed of all our movements by VHF radio. At 18.15 hours – we continued our task, Pilots Santagata, Baffo and myself and the helmsman Fanciulli went aboard the pilot boat PREVE and went out to sea for an ulterior search of survivors. Arriving at the red light of the seaward breakwater, Captain Tanlongo of the TETI comunicated that he had seen another three survivors along the rocks at the International Fair zone inviting me to control the zone. I searched all along the said rocks coming up to about 100 metres of the mouth of the River Bisogno at Foce, at the point where it flows into the sea, but unfortunately didn't find anyone. At 19.30 hours we returned to base at the Pilots Station. Signed, Pilot Capt. Giovanni Santagata - Genoa, 16 April 1970. After these events the Silver Medal for curageous service - Benemerenza Marinara - was awarded to both Pilots Giovanni Santagata and Aldo Baffo and the Bronze medal to Capt. Giuseppe Fioretti. Quando l'anticiclone delle Azzorre si ritira verso W, si apre una porta ai flussi di aria fredda marittima di origine atlantica che, provenendo da NW e correndo lungo il bordo dell'alta pressione, giungono in Mediterraneo accelerate dal corridoio (vedi freccia nera nella carta meteo). Si stabilisce così il regime dei venti di Maestrale, caratteristico di queste zone, che sorgono spesso improvvisamente, forti nel golfo del Leone, più forti sulle coste occidentali corse e ulteriormente accelerati dall’imbuto delle Bocche di Bonifacio. In questa premessa c’è la spiegazione di quanto successe quarant’anni fa, in quel famigerato 9 aprile 1970 che vide sfracellarsi sulla diga del porto di Genova la T/n London Valour. Chi c’era non può che ricordarlo come “il giorno del diavolo”. 22 persone perirono sotto gli occhi di una città attonita, sbalordita e impotente dinanzi ai terribili colpi di mare sollevati da un vento che in poche ore girò da Scirocco a Maestrale rinforzandosi ad ogni quadrante della rosa dei venti. In quelle condizioni estreme, raramente viste dai genovesi, a poco o nulla valsero i numerosi tentativi di salvataggio improvvisati dai coraggiosi soccorritori. Il 2 Aprile 1970 la nave partì da Novorossisk diretta a Genova con 23.606 tonnellate di cromo. Il 7 Aprile giunse a Genova e diede fondo l’ancora in rada, nell’attesa d’andare in banchina per le operazioni di scarico. Alle 12.00 del 9 Aprile la pressione barometrica era molto bassa: 748 mm. Il vento era debole e spirava ancora da Scirocco. La diga foranea spariva letteralmente sommersa dalla risacca e quel gonfiore del mare mostrava in quel momento un fenomeno meteo esagerato, mai visto prima: senza onde e senza vento, il porto e la città non avevano più protezione, la diga era come inghiottita. Secondo le testimonianze di bordo, nessun avviso di burrasca era stato emesso via radio o segnalato nell’ambito portuale dal Semaforo della Lanterna. Alle 13.00 il vento girò a SW ed andò aumentando d’intensità. Ci fu una riunione sul ponte di comando della London Valour, ma il comandante D. M. Muir non diede particolari disposizioni e si ritirò in cabina con sua moglie. Alle 13.30 l’ufficiale di guardia sul ponte avvisò il Comandante e l’ufficiale di guardia in macchina che il tempo era in netto e rapido peggioramento, ma fu il 1° Ufficiale di coperta che, scorgendo dal suo oblò la diga estremamente vicina, diede l’Allarme Generale. Il C. Macchinista recepì l’emergenza e si prodigò per accelerare al massimo l’avviamento della turbina. Purtroppo la prontezza a manovrare la macchina fu data soltanto pochi minuti dopo l’impatto della nave contro la diga. Alle 13.50 il vento da libeccio era forza 8 e il barometro segnava il valore più basso della giornata 742 mm. Nel frattempo il fortunale da libeccio raggiunse e superò i 100 Km/h sollevando onde eccezionalmente alte e violente che si abbatterono frontalmente contro la diga foranea. Verso le 14.25, l’ancora del mercantile britannico London Valour non mordeva più il fondale e cominciò ad arare e in pochissimi minuti la nave scarrocciò per 1300 metri, dalla sua posizione d’ancoraggio fino allo schianto contro la scogliera frangiflutti della testata di levante della diga Duca di Galliera. La London Valour in agonia sugli scogli della diga. Alcuni naufraghi sono visibili in controplancia. Notare a sinistra l’imbarcazione dei piloti che si è impennata sulla cresta di un’onda. Sul posto arrivarono i piloti portuali, l’elicottero dei VVFF, rimorchiatori, motovedette della Capitaneria, dei Carabinieri, della Finanza e della Polizia, Alle 14.45 i valorosi Vigili del Fuoco misero in funzione un va e vieni, (una doppia cima di nylon tesa tra la diga e il ponte di comando), sul quale scorreva una carrucola munita di cintura a braga per consentire il salvataggio di un naufrago per volta. La nave si spaccò in due tronconi e i membri dell'equipaggio si trovarono divisi in due gruppi, tutti muniti di giubbotto salvagente. Dorothy, la moglie del comandante Edward Muir, fu sbalzata dall’imbragatura della precaria funivia e precipitò tra gli scogli spazzati dalle onde, sotto gli occhi del marito, nonostante i tentativi di salvataggio di un Vigile del Fuoco che si tuffò invano più volte. I depositi di nafta cedettero e il combustibile, nero e denso come catrame, si sparse in mare e avviluppò i naufraghi caduti in acqua. Tra questi, il comandante del mercantile, che rifiutò l'aiuto di un soccorritore, si slacciò il giubbotto e si lasciò andare. “Volteggiava sulla scena del disastro, sfidando la bufera, il leggendario elicottero dell'ardimentoso capitano Enrico, eroe dei Vigili del Fuoco, che poco tempo dopo non sarebbe più rientrato da un'ennesima operazione di salvataggio”. Nella fase iniziale della tragedia, una parte dell’equipaggio si era concentrato presso il cassero centrale della nave. Questa era la zona più pericolosa perché battuta e schiacciata tra le onde e la diga. Un razzo ed una cima di collegamento furono comunque sparati sulla diga ed i Vigili del Fuoco riuscirono ad approntare il già citato Va e Vieni, che poté salvare tre marinai indiani. L’apparato sembrava collaudato ed il Comandante convinse la moglie a mettersi in salvo, ma subito dopo s’inceppò. Alla signora Muir mancarono le forze per resistere aggrappata alla teleferica e precipitò tra gli scogli dinanzi agli occhi atterriti dell’equipaggio e del marito che, incurante del pericolo, volle darle l’estremo saluto con la bandiera inglese (Union Jack, N.d.A.). Questo fu il momento più drammatico e commovente della tragedia che colpì la nave ed il nostro scalo. Poco dopo, un’onda gigantesca spazzò via il marconista Mr. Hill e sua moglie che sparirono insieme ed annegarono tra i flutti. Il 2° Macchinista Mr. Carey fu strappato dalla stessa onda e scaraventato in mare, ma fu miracolosamente salvato dalla ciambella dell’elicottero del Cap. Enrico. In quell’occasione il Comandante fu visto per l’ultima volta, era ferito gravemente ad una gamba e volle seguire la stessa sorte di sua moglie. La stessa incredibile onda aveva sollevato il 1° Ufficiale di coperta Mr. Kitchener, 31 anni, di due piani, sino alla Monkey Island (il ponte della “bussola normale”, ubicata sopra la timoneria, N.d.A. ), dove già si trovavano il Cadetto Mr. Lewis ed altri marinai indiani. Questi ultimi, sebbene sollecitati dai loro superiori, rifiutarono il tuffo della speranza e perirono massacrati tra gli scogli. b)- Nell’impatto con il terminale della diga, la poppa della nave risultava libera e sporgente. Da quella posizione più esterna, i più coraggiosi tra l’equipaggio si gettarono in mare e subito dopo furono raccolti dai soccorritori. Altri provvidenziali salvataggi avvennero tramite il collegamento nave-diga approntato e curato con estremo coraggio dai Vigili del Fuoco e dai marinai della nave. Tra i tanti atti di coraggio e di grande valore compiuti dai genovesi, desideriamo ricordare quello che si verificò alle 16.17 quando, sulla cresta di un’onda gigantesca, arrivo un naufrago, tutto nero di catrame, al di là della barriera di protezione del canale di calma. Italo Ferraro, un pallanuotista-sub di quasi due metri, si tuffò con muta e pinne dal terrapieno della Fiera e, come un angelo calato dal cielo, afferrò il marinaio, lo mise in salvo e poi sparì. Nell’impatto della nave contro gli scogli appoggiati alla diga, lo scafo subì notevoli spaccature, dalle quali straripò il fuel oil, con cui venivano accese le caldaie. Il prodotto combustibile si sparse in mare, la cui superficie divenne una lastra nera che imbrattò completamente i naufraghi tanto da renderli irriconoscibili, estremamente scivolosi e quindi difficilmente catturabili dai soccorritori. Nel disastro perirono 22 persone. Si salvarono 38 membri dell’equipaggio: i più coraggiosi, coloro che si tuffarono in mare e furono spinti dalle onde tra le braccia dei soccorritori che si erano appostati un po’ ovunque, in quelle acque vorticose, schiumose ed impazzite. Quando, dopo il naufragio, i sommozzatori s’immersero per ispezionare lo scafo, notarono che le sette lunghezze di catena (ogni lunghezza misura 25 metri, N.d.A.) filate dalla nave per ancorarsi, erano distese ed intatte. L’ancora poggiava sul fondale melmoso di 25 metri, però, le unghia delle marre erano rivolte verso l’alto e tra loro passava un cavo d’acciaio. Questa circostanza fu la fatale spiegazione del cedimento dell’ancora della nave e del suo rapido avvicinamento alla diga, nel momento di massima forza del mare e del vento. Le marre si capovolsero nell’impatto con l’insospettata presenza di un cavo d’acciaio e non poterono mordere il fondale, fare presa nel fango e porre quindi resistenza all’effetto di quella libecciata devastante. Il naufragio e la conseguente perdita della London Valour fu causata dall’errata condotta del comandante Cap. Donald Marchbank Muir, 57 anni…. Emerse pure che: “il comandante dimenticò di avvertire i suoi Ufficiali di coperta che, alla Sezione Macchina della nave, (C.Macchinista, Mr. Samuel Harvey Mitchell, N.d.A.) necessitava un congruo preavviso prima di dare la tradizionale “prontezza”, a causa d’ordinari lavori di manutenzione ai motori ausiliari che erano, comunque terminati in mattinata. Nonostante l’eroico comportamento di tutti i soccorritori intervenuti in mare, in terra e in aria, a rischio della propria vita, il bilancio delle vittime fu molto grave e la tragica lezione impartita dall’ammiraglio vento impose nuove regole ai responsabili del porto. Nuove norme di sicurezza furono riscritte e, grazie alla loro puntuale applicazione, molte altre vittime furono in seguito evitate. Ci riferiamo all’incendio ed esplosione della superpetroliera Hakuyoh Maru avvenuta nel porto petroli di Multedo il 12 luglio 1981 e soprattutto all’incendio, esplosione e affondamento di un’altra superpetroliera la Haven al largo di Arenzano avvenuta l’11 aprile 1991. La London Valour affondò durante l'ultimo viaggio. Il suo relitto, con le sue sovrastrutture emergenti, rimase per diciotto mesi come simbolo e monito di quanto il dio-mare, al di là d’ogni tecnologia, sia ancora l’invincibile peso massimo, posto al centro di un immenso ring e sempre pronto a decidere il destino di chi non lo tema o non lo rispetti secondo le sue regole. Appoggiata a pochi metri dal vecchio fanale rosso d’entrata, la ex-nave britannica non impedì la costruzione dell’ultimo pezzo di diga verso levante. Per la verità, fu lasciato un varco navigabile per il transito delle imbarcazioni minori addette alla risoluzione dei vari problemi creati dal relitto. Dopo qualche mese dal disastro, entrò in scena la ditta olandese Smit Tak International Bergingsbedriff, specialista a livello mondiale in operazioni di Recuperi Navali, che vantava un originale sistema per rendere galleggiante i resti della London Valour, tramite l’immissione di milioni di palline di polistirolo nelle sue capienti stive. La Smit Tak non riuscì a riportarla interamente a galla, ma le garantì, tuttavia, una discreta galleggiabilità, che avrebbe dovuto assicurare il suo rimorchio in mare aperto e quindi l’affondamento, con l’uso di dinamite, nella zona delle Baleari, ad est di Minorca, su un fondale di circa 3500 metri, denominata “Fossa delle Baleari”. L’abisso marino, destinato ad accogliere le spoglie della London Valour, era stato accuratamente scelto dalle Autorità competenti, con il preciso intendimento di rendere sicura la navigazione in Mediterraneo, oltre che salvaguardare le attività marinare dei Paesi limitrofi, legate alla pesca, turismo ecc… da possibili problemi d’inquinamento. Il 12 ottobre del 1971, ai primi chiarori dell’alba, il rimorchiatore oceanico Vortice disincagliò il relitto dalla diga e lo fece con molta accuratezza per non creare superflue lacerazioni sotto lo scafo, quindi lo consegnò ai rimorchiatori d’altomare Torregrande (capo convoglio) e Genua per il traino prestabilito. Siamo così giunti all’epilogo di questa incredibile tragedia marinara e forse nessuno, meglio di Charly, il Comandante del Torregrande, può accompagnarci in questa specie di rito funebre a conclusione di una storia tristissima che, volenti o nolenti, ci appartiene completamente. “Nonostante il tempo fosse buono, al momento della partenza da Genova, il bollettino meteo era pressoché indecifrabile, nel senso che lasciava spazio a quella parola “variabilità” che anche i più giovani lupi di mare imparano presto a detestare e a diffidare per la sua incapacità di prendere una posizione chiara e quindi di non prevedere proprio nulla…Ma il problema più serio, fin dall’inizio del viaggio, era del tutto psicologico: era infatti difficile controllare serenamente la navigazione di prora, avendo al traino un relitto che pescava 22 metri, come una superpetroliera dei giorni nostri, e del quale si potevano vedere soltanto le colonne dei bighi, che apparivano tra l’altro bianchi e fatui come fantasmi e, come tali, capaci di sparire in qualsiasi momento. Torregrande e Genua avevano un tiro complessivo di 4.500 cavalli di razza, che furono subito totalmente sbrigliati, nell’illusione d’uscire al più presto da quell’incubo! Purtroppo la velocità era poco superiore ai tre nodi. Altri 10.000 cavalli di potenza, magra consolazione, non avrebbero aumentato di un decimo l’andatura, a causa dell’inesistente idrodinamicità della sua massa informe e sommersa. Tra i nostri equipaggi, cui non difettava certo l’esperienza, la parola d’ordine era: “occhi aperti ragazzi”, mentre avevo già preso tutte le misure d’emergenza, tra cui l’aver predisposto un marinaio, di guardia nel locale del verricello automatico (chiamato Troller, N.d.A. ), pronto a tagliare il cavo di rimorchio con la fiamma ossidrica, in caso d’affondamento improvviso del relitto. Dopo il tramonto di quell’insolita giornata di navigazione, il tempo andò peggiorando e nella notte, forti piovaschi impedivano il pieno controllo visivo del rimorchio, che appariva protetto da una barriera bianca di pioggia e schiuma, sulla quale andavano ad infrangersi i potentissimi fasci bianchi di due proiettori da 1000 watt ciascuno. “Se o bon maina o se conosce a-o cattivo tempo… sti chi se treuvan a bordo pe sbaglio; se né battan u belin du periculu, du relittu e de Baleari, pensan sulu a racca cume bestie marotte…! Ma ghe lo ditu in sciu muru au capu: loda o ma e stanni a ca, besugu! Ma chi va imbarcou? (Trad. Se il buon marinaio si vede nel cattivo tempo…questi qui si trovano a bordo per sbaglio; se ne fregano del pericolo, del relitto e delle Baleari, loro pensano solo a vomitare come animali ammalati! Ma gliel’ho detto a muso duro al capo: loda il mare, ma stattene a casa…Ma chi vi ha imbarcati? Il troncone della ex-nave britannica London Valour colò a picco alle 02.58 del 13 ottobre 1971, sbavando schiuma, eruttando migliaia e migliaia di palline di polistirolo e salutando il mondo con un fragoroso rigurgito”. Dopo un anno d’inutili studi e progetti andati in fumo, il relitto fu rimorchiato al largo da due rimorchiatori d’altomare al comando dello scrivente. La London Valour non raggiunse la Fossa delle Baleari, ma affondò per la seconda volta, sotto i colpi di una violenta burrasca a 90 miglia a sud di Genova, su un fondale di 2640 metri, in latitudine 43°02’N e longitudine 08°06’E, ad una quarantina di miglia da Imperia e circa cinquanta ad Ovest di Capo Corso. Il ruota del timone fu donata all'Ospedale San Martino che aveva assistito i superstiti. La campana è oggi conservata presso la Chiesa Anglicana di Genova.La bandiera è stata consegnata alla Capitaneria di Porto. Fu una tragedia inverosimile, a poche bracciate dalla costa, sotto gli occhi attoniti di una storica città marinara. Quel giorno qualcuno scrisse: la London Valour si è inabissata definitivamente, rifiutando ancora una volta di sottomettersi al volere dell’uomo e scegliendosi da sola il fondale che è divenuto la sua tomba, 2640 metri al disotto della superficie di quel mare che così selvaggiamente l’aveva ferita.